After nearly 31 years of dedicated service to NASA, the remaining space shuttles used by it are being retired. And it couldn’t be done soon enough, for the whole idea of the space shuttle as a means of slashing costs for space launches and making space more accessible was doomed from the start. The reason: the way those vehicles were made in the first place. 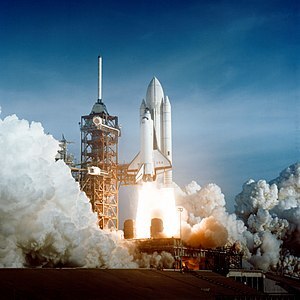 There were four parts to each space shuttle at launch: the orbiter that most people think about as THE Space Shuttle, the two Solid Rocket Boosters (SRBs) , and the External Fuel Tank (EFT) . After the shuttles were launched, the SRBs would be jettisoned after a few minutes, and then the EFT, drained of its contents, would be jettisoned too just before the shuttle reached orbit. The SRBs would be recovered from the Atlantic Ocean by ships that would drag them back to Cape Canaveral to be used again; the EFT would simply fall back into the atmosphere to be burned up upon reentry. Thus even though the space shuttle was supposed to be resuable, the actual largest part of it, the EFT, wasn’t! But no one seemed to notice that. Of the five shuttle orbiters that were built (why so few? ), TWO were destroyed! Those were the Challenger in 1986, and the Columbia in 2003. The first disaster was caused by the launching of the shuttle under extremely low temperatures, resulting in a failure of one of the SRBs. Leaking and burning gas from that SRB ignited the EFT, destroying the whole shuttle. The second disaster was caused by a small piece of the EFT hitting the wing of the orbiter, causing enough damage to make reentry too dangerous. In both cases, NASA administrators behaved so arrogantly that they ignored warnings made to them by engineers who knew the limits and risks of the shuttles. As a result of that stupidity, 14 people died needlessly. If I had been the head of NASA in the 1970s, I would have rejected the proposed design that eventually came out. Instead, I would have insisted on the shuttle launching and landing as a single piece. I also would have demanded that the shuttle have the potential for interplanetary flights. In all the flights the real shuttles made, they NEVER went beyond Earth orbit, not even to the moon! Manned flights back to the moon and then to Mars, which the shuttle could have made possible, were not even considered! The space program of the United States was ultimately ruined by the vast sums we spent on the Space Shuttle projects. It’s perhaps the most massive disappointment in all of American history! This entry was posted in science, Social studies and tagged NASA, Solid rocket booster, Space Shuttle. Bookmark the permalink.